First soak both urad dal & idli rawa in separate bowls with water. Leave for 4 hrs until they are soaked well. After 4 hours, drain the water from dal. Wash dal with plenty of water and drain away the water. Make this process for 2 to 3 times to wash well. Now grind the urad dal in grinder / mixy. Grind soaked dal in smoother consistency by pouring sufficient water in it occasionally. Check the batter while grinding it. After take batter into a bowl from mixy / grinder. Now drain water from soaked idli rava also. Wash rava also with plenty of water for 2 to 3 times and drain away the water. After cleaning rava with water, squeeze excess water from the rava with hand. Add all squeezed rava into the batter bowl & mix it well with out any lumps. Next day it is ready to make soft idli. If the batter is very thick, you can pour sufficient water in it to make into semi thicker consistency. Now mix salt to taste in the idli batter & mix it well. Now take idli plates, apply with oil / ghee to idli moulds. Fill the idli moulds with sufficient batter & it is ready for cooking. Take idli cooker/ normal cooker, pour 1/2 glass water into it. Now put idli plates into the cooker and cook in low flame. Put the lid on it and leave for 15 to 20 min to cooking. If you are cooking in pressure cooker, don't put whistle on it. After 20 min, open the lid and check while idlis has cooked or not. For checking idlis has cooked or not, wet your fingers and check the idli. If it is not sticking to the finger, it has cooked well. If it is not cooked, leave for another 3 to 5 min to cooking. After idli cooked well, make the stove off and leave for 5 to 8 min. Now open the lid and take idlis with a spoon. Now you are ready with smooth & soft idlis in front of you. 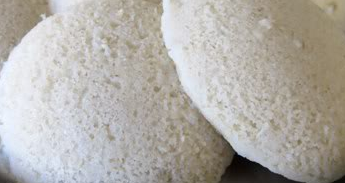 Eat & enjoy very tasty, delicious, yummy & healthy tiffin item rava idli.